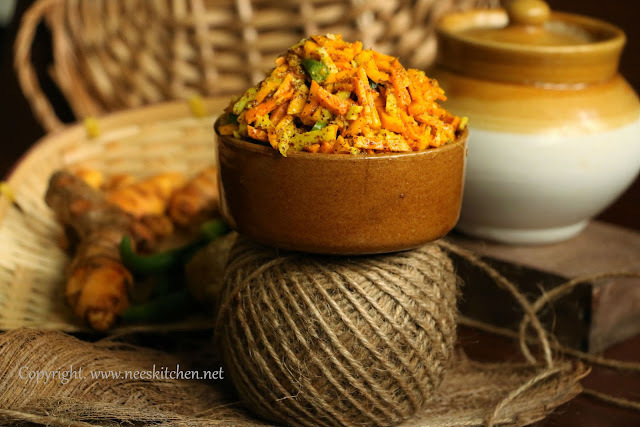 Fresh turmeric pickle is an age old recipe passed to me from my mom and grand mom. In Singapore we get it almost throughout the year. However I don’t know for which dishes it has been used. Fresh Turmeric, ginger, green chili is mixed with salt,mustard powder, lemon juice and little oil. The pickle is then left to be marinated for a day before consuming it. It goes very well with curd rice, roti’s & paratha’s. We used to make in India only after Pongal as we purchase them only during that time. Infact we buy at home only during that time in India. After the festival this pickle is made. Turmeric is has myriad of health benefits and having them in our food every day is good to improve our immunity. Ginger helps in digestion. You may adjust the spice levels by adding as many chili’s as you want. Lemon is a must and do not ignore it as it gives a very good taste to this pickle. 2. 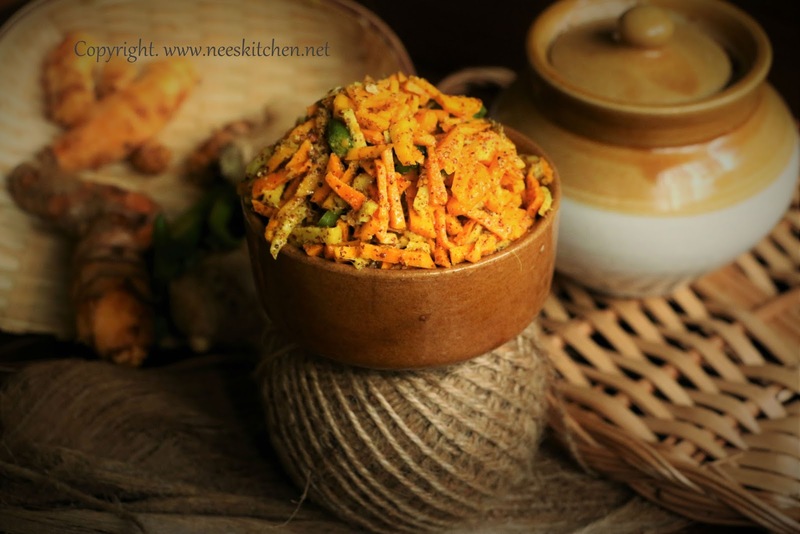 Peel the turmeric skin and chop them finely like thin slices. 3. Peel the ginger skin and chop them finely like thin slices. 4. Chop green chili into small round shapes. 5. Mix Turmeric, ginger, green chili with mustard powder, salt and oil. 6. Squeeze lemon. Adjust the taste of lemon as needed. 7. Mix well and transfer to a bottle. 8. Shake them 1 day after making the pickle. 9. Consume after 1 day for better taste. Keep them refrigerated after 4 days. 1. Adding too much ginger might might over ride the complete taste. Always use only 1/3 of turmeric. 2. If the climate is hot, put them in refrigerator after a day of marination.